The faculty of the UC Davis English Department supports the Board of the Davis Faculty Association in calling for Chancellor Katehi's immediate resignation and for "a policy that will end the practice of forcibly removing non-violent student, faculty, staff, and community protesters by police on the UC Davis campus." Further, given the demonstrable threat posed by the University of California Police Department and other law enforcement agencies to the safety of students, faculty, staff, and community members on our campus and others in the UC system, we propose that such a policy include the disbanding of the UCPD and the institution of an ordinance against the presence of police forces on the UC Davis campus, unless their presence is specifically requested by a member of the campus community. This will initiate a genuinely collective effort to determine how best to ensure the health and safety of the campus community at UC Davis. 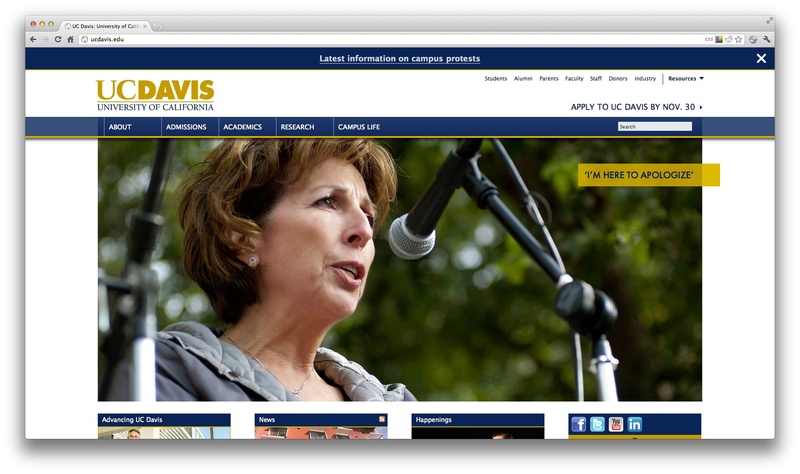 The school's home page currently features a photograph of Chancellor Katehi, captioned "I'm here to apologize." See BoingBoing for much, much more.